(Results Vary By Device). Leak-Resistant Construction. Holds Power Up To 20 Years. · Last up to20% longer in toys versus Energizer MAX. · Weigh 1/4 less than standard Alkaline. · Up to 10-year backup battery in ac-powered Smoke detectors. 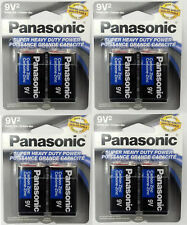 10 PCS 6F22 9V Heavy Duty Batteries. 6F22 9V heavy duty. Battery Type. Ultralife 9v U9VLJ lithium Battery. 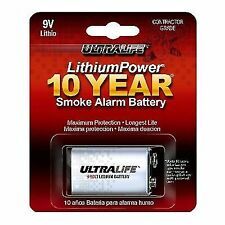 Ultralife 9V J Lithium Battery. Four (4) Loose Varta Lithium 9V Batteries. 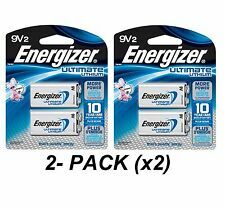 These Energizer 'Ultimate' Lithium 9Vs batteries have replaced the now obsolete Energizer 'Advanced' Lithium 9Vs. 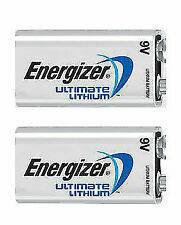 Energizer Ultimate Lithium. Energizer MAX. We want each and every one of your buying experiences to be an easy and pleasant one. Trending at $33.59eBay determines this price through a machine learned model of the product's sale prices within the last 90 days. 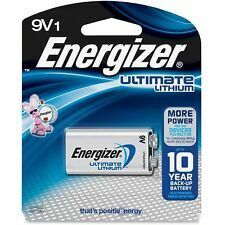 9 V Energizer Ultimate Lithium Batteries. 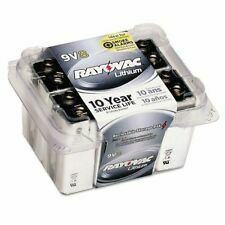 Rayovac R9VL-1 Lithium Carded Battery - 9V- 1 Pack Condition is New. Shipped with USPS First Class Package. 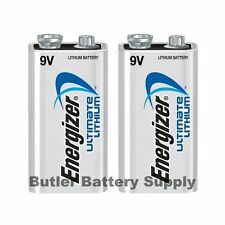 (9V Energizer Ultimate Lithium Batteries. Check-Out Now! Guam, Puerto Rico, Virgin Islands, etc.). (Results vary by device). Holds power up to 20 years. Material(s): Lithium Manganese Dioxide. Battery Size: 9V. Battery Type: Lithium. Nominal capacity: 1200mAh. Model Number : ER 9V. 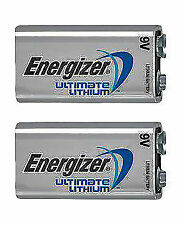 Energizer L522 Ultimate Lithium 9V Battery. 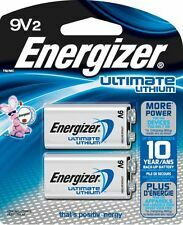 Energizer Ultimate Lithium 9V batteries are long-lasting -- at nearly 10 years of shelf life, whether or not they are in certain devices. Now your child's toys can go further on their batteries, and so, be more efficient -- Ultimate Lithiums can hold onto their power and energy levels for up to 20% longer than another 9V that Energizer manufactures -- the Max®. Product Model #: L522BP. Product Model # L522BP. Manufacturer Part Number: L522BP. This 9-volt lithium battery lasts up to 20 percent longer in toys vs. Energizer MAX batteries and weighs 1/4 less than standard alkaline. New. 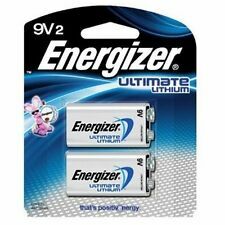 9V2 Energizer Ultimate Lithium Batteries. Exp. Date- 12/2026. (Results vary by device). Holds power up to 20 years. Eveready L522BP. 9V, PP3, LR22, MN1604, BLOC, E-BLOC, 6LR61, 1604AU, X22, 1604, 1604A, 1604AC, 4022, 522, 6AM6, 6F22, 9VOLT, A1604, CLR6, K9V, KA9, ND65V, R22, RB100893. Lithium Ultra 9V batteries . Type Lithium. Battery Size. Battery size: 9V block. 100% authentic, original taste. Type: Lithium. Validity: December 2026. Varta ULTRA LITHIUM 9V. Most powerful lithium battery from Varta. Insert corretly. Other Information. When operating electronic devices, the right battery can help extend sessions much longer than they would have lasted otherwise. Lithium batteries that utilize V Block technology can help extend device lifespan as well. Reduced energy consumption can help with device longevity. What is a Lithium based battery? The hardware is specialty technology designed to add on to the design of standard battery technology. It is typically utilized in devices that require 24/7 operations. Examples include fire alarms, professional-grade film cameras, and security devices. The batteries main functionality is to distribute charges in such a way that allows it to last for exponentially greater time periods than would be possible otherwise. The product is commonly packaged in bundles, containing five or so separate pieces of hardware. The batteries are constructed by using lithium-grade components packed into dense spaces and given the appropriate charges to function as a power device. They are small enough to fit into the palm of your hand and are typically a polished black or metallic color. Lithium batteries can come in slight variations of power and copyrighted functionalities. 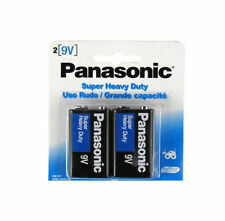 9V batteries are an example of this variety. How do you install Lithium batteries? Each device may have a slightly different procedure, so refer to owner's instructions. Listed below are the general steps required for installing the hardware, in sequential order. 1. Locate the reception area on the target device. On some devices, such as smoke detectors, the reception area is locked down by small pieces of removable hardware. Screws are the most commonly utilized securing device, though in some scenarios the area may be locked behind bolts. Once removed, set the installation hardware aside for later utilization. 2. Remove the previously installed power hardware. Take a small, dry-cleaning apparatus, like a cotton swab or microfiber rag, to thoroughly clean the reception area. 3. Take your own hardware and install it in the same location. Ensure the correct ends of the battery are aligned with the markings included on the target devices. Securely lock the hardware in place using the aforementioned installation tools. If the device is functional after installation, the process is complete. What types of devices utilize the hardware? Lithium batteries are typically associated with hardware that is left on for abnormally long periods of time. Most of these kinds of hardware are utilized in home protection and security scenarios. Cameras, monitors, smoke detectors, fire alarms, and motion capturing devices all utilize the hardware to function. Some other types of devices, such as portable cellphone chargers and gaming devices, utilize the hardware as well. In some scenarios, the power devices are pre-installed charging devices, such as those found in computers and laptop chargers. These batteries can be used as replacement hardware in these scenarios. In other outlier scenarios, cellphones can utilize the hardware as well.